Everyone knows there is tons to do in NYC over the holidays, but what the hell do you do with your kids when all the Christmas decor has come down and it’s still too cold to go to the playground? Do you just hibernate in your apartment and let them have unlimited screen time until winter blows over? If you’re visiting the city, do you build a fort in your hotel room and order in a pizza? But if your kids are getting stir crazy indoors, have no fear! There are a bunch of kid-friendly activities in NYC that are perfect for when it’s particularly frosty outside. The most popular rinks in NYC are Rockefeller Center, Bryant Park, Brookfield Place and Wollman Rink in Central Park. If you want to get out of the cold, there’s also an indoor rink at Chelsea Piers (check for times since it’s often used for private lessons). But my favorite rink, particularly for little kids just learning, is the tiny rink at the Standard by the High Line. They’ve got penguins for toddlers to use for balance, outdoor seating with heat lamps, and table service with a limited menu of food and drinks. Yep, that means you can get yourself a cocktail after you’ve spent an hour picking your kid up off the ice. Yes I know, Central Park is really a place that people like to go in warmer weather, but we went at the end of December right after it snowed and found out it’s particularly beautiful this time of year too. In the summer, part of what’s wonderful about the park, is that in certain parts, you almost forget you’re in NYC. But in the winter, with no leaves on the trees and all the water frozen over, you see the skyline in every direction. It’s pretty stunning. Plus, you can go ice skating at Wollman Rink, sledding at Pilgrim Hill or Central Park Sledding Hill or take a ride in a horse and carriage (if you’re not ethically opposed to that sort of thing) with a heavy winter blanket draped over your family’s lap to keep everyone snuggled up and warm. But there are smaller museums that you should consider too— like the Math Museum (Mazzy’s personal favorite) right off of Madison Square Park. It’s got a square-wheeled trike to test out, a kinetic wall, robots to build, patterns to make and a light up floor with mathematical games controlled by the movement of your feet. (Bonus! If you want a quick bite to eat, the original outdoor Shake Shack is in the park and the lines won’t be nearly as long in the winter.) The NYC Transit Museum is also a fun one for kids, particularly kids who are obsessed with trains and the NYC subway system. 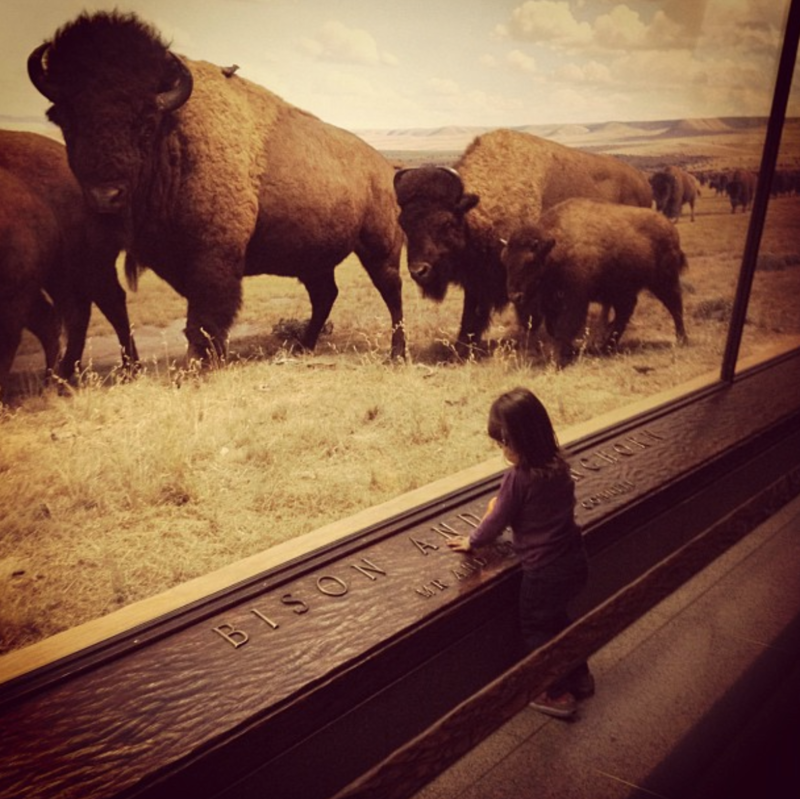 Other museums I recommend for kids are the Museum of Moving Image, the Museum of the City of New York, the New Museum, the Whitney, and the Jewish Heritage Museum. There are lots of fabulous book stores that have great sections for children, but Books of Wonder stands out because the entire store (a sizable space) is entirely dedicated to kids. There are walls and walls of board books, picture books and chapter books all spaced out by age and interests. There’s also an area in the back that hosts a regular story time as well as drop-in classes for babies and toddlers. The cafe at the front sells healthy pastries and sandwiches, but if you are looking to eat something more exciting, I recommend going across the street to City Bakery. In addition to a pretty delicious salad bar selection, City Bakery has huge chocolate chip cookies, flaky pretzel croissants and heaping cups of hot cocoa with their signature homemade marshmallow plopped on top. A few weekends ago, I took the girls to the National Geographic Encounter: Ocean Odyssey in Times Square. You buy tickets online for a specific time so there is no wait and they keep the groups small so it’s not crowded once you are inside. What happens next is a guided virtual tour across the ocean, from the South Pacific to the coast of California, where every room you enter is a different immersive experience. There are no real fish inside and you won’t get anything close to wet. Instead, you’ll walk into rooms with wall to wall and floor to ceiling screens that make you really feel like the ocean is all around you. Sting rays swimming under our feet was a particularly cool experience, as well as an interactive wall of virtual seal lions where their movements were directed by your own. There is no better time to take in a Broadway show than in the dead of winter. Plus, you get to see Times Square with somewhere to go. Currently, the kid-friendly shows are Lion King, Aladdin, Wicked and School of Rock. There’s also Spongebob Squarepants but I refuse to see it. Lion King was Mazzy’s first Broadway show, while School of Rock was something we saw recently since it’s more appropriate for older kids. She was totally amazed that all the kids were performing with their own instruments. I was too. NYC is not historically known for malls, but in recent years, a few spectacular ones have opened up. The Oculus, the Shops at Columbus Circle and Brookfield Place are all beautifully designed buildings with higher end stores and great restaurants. Columbus Circle also boasts an amazing view of Central Park from the top. Brookfield Place is on the Hudson River and has a pretty great food court, along with a string of outdoor restaurants. The Oculus (right near the 9/11 Memorial) is our favorite. The building is brand new and looks like a space ship just landed in the middle of Manhattan. It’s also way larger than it looks from the outside since most of the building is underground— it’s one of the biggest transit hubs in Manhattan. It’s got an Apple Store, a Shake Shack and an Eataly, Mario Batali’s ode to all things cheese and pasta. I recommend walking through Eataly, all the way to restaurant section in the back and sitting down for some pizza. On the kid’s menu, the pizza comes in your child’s choice of three different shapes— a heart, a fish or a bunny. While the Empire State Building’s observatory is outside, the One World Observatory is completely indoors, making it the perfect thing to do on a cold afternoon. I recommend booking ahead of time. I haven’t gone yet but it’s at the top of our list. In addition to some of the best views of the city, I hear they have a really cool virtual experience in the elevator as you rise to the top. Obviously, movies are a great thing to do when it’s cold out, especially since so many theaters now take reservations for full reclining seats, like our favorite theater— the Loews on 3rd Avenue and 10th St. For an even more indulgent movie experience, check out iPic in South Street Seaport, which isn’t only a movie theater, but a full service bar and restaurant. The theaters play new releases with lounge chairs, tables, menus and servers who will deliver your dinner directly to you. After the movie, make sure to check out Sea of Light, an outdoor art and light installation, activated by movement and sound (and even the clothes you wear) which is currently on Fulton Street through March. There are many carousels throughout the city (some open and some closed for the winter), but the best one to visit when the temperatures drop is Jane’s Carousel in Dumbo. The carousel is on the water, along the Brooklyn-side of the East River. It’s completely encased in glass, so you can still see one of the best views of Manhattan while you ride around in circles. Dumbo is also a really fun part of Brooklyn to explore, particularly along the boardwalk. Since the famous Grimaldi’s went downhill, I hear Juliana’s is now the place to go for pizza. If you’ve got a kid who would really appreciate dressing up and acting fancy for the afternoon, I highly recommend getting tea at the Plaza. 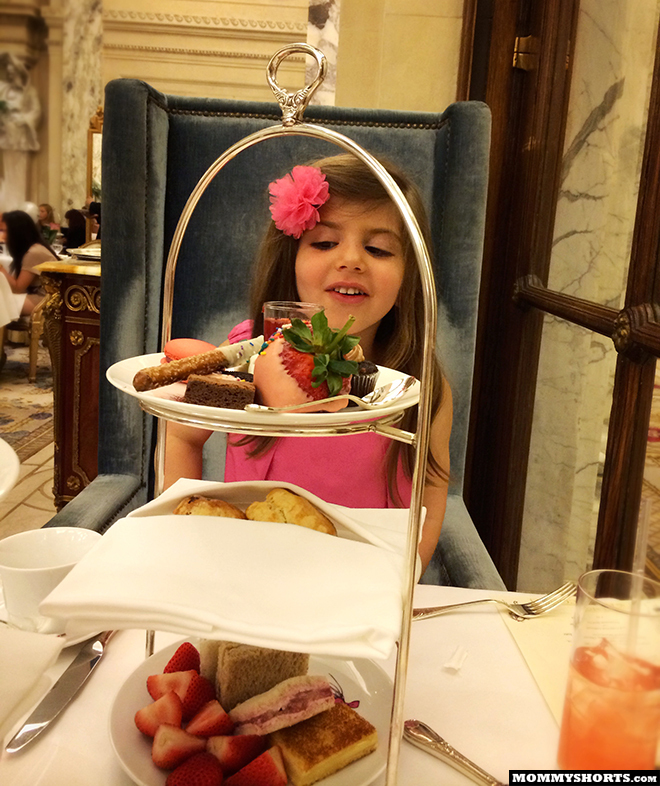 The Plaza, as your kid might know, is the home of Eloise (if you are staying at the hotel, you can reserve the Eloise suite designed by Betsy Johnson) and you’ll find a special Eloise tea menu at The Palm Court in the hotel lobby. You can get the regular adult tea while your child feasts on a three tiers of kid-friendly finger sandwiches (fancy grilled cheese, PB&J, etc. ), scones with cream and jelly, and sweets like chocolate covered strawberries, cupcakes and brownies. You can also visit the amazing food court underneath the Plaza which also houses an Eloise shop, complete with books, toys and clothes in the pinkest setting you ever did see. One of my favorite places to take the kids since they were little is the Children’s Museum of the Arts in Tribeca. Unlike most of the other children’s museums we’ve been in (which are large playrooms that usually appeal to toddlers), the CMA is a bit more sophisticated and really about ART. They’ve got an art gallery that appeals to young kids, a big room for younger kids to explore different materials like finger paint, foam and LEGOS, and a room for older kids dedicated to hands-on crafts and painting. Your kids with appreciate the huge wooden easels, the big basin for cleaning brushes and the incredible selection of paint. It actually feels like a professional art studio where you’re allowed to get creative and make a mess. Another highlight is the clay animation bar in the back. If your kid wants an art break, there is also a room upstairs filled with spinning chairs and a long hallway that’s been completely yarn bombed. Max Brenner, Chocolate by the Bald Man is a popular spot serving all things chocolate that is frightening close to our apartment. There’s a chocolate fountain when you walk in and although they serve things like burgers and mac ‘n cheese, the real star is obviously the LENGTHY and photo-filled dessert menu. It includes things like chocolate pizza, syringes full of liquid chocolate and churro taco waffles. While this experience might seem slightly touristy and over-the-top, it’s fun to indulge your kid’s sweet tooth in a place where dessert for dinner is totally acceptable. As long as you don’t make it habit. Full disclosure— I took my kids to Max Brenner expecting to wow them with all the chocolate options (and eat whatever they chose myself) and then they ended up getting chicken fingers and plain scoops of ice cream. Boy, was I disappointed. Maybe your kids will be more impressed? Alright, that’s all I got, unless you want me to start talking about arcades and bowling. I hope I named a few places you hadn’t considered and I’d love to hear about more ways you have fun in the city when it’s zero degrees! What are your favorite things to do with the kids when its cold outside? Grimaldi’s?!?!? Don’t do it. Just recently closed down for mice. Head next door to Patsy Grimaldi’s restaurant Juliana’s. Infinitely better. Thank you! I guess it’s been awhile since we’ve been there! I don’t recommend getting the chocolate syringe at Max Brenner, my 5yo tried it and ended up squirting chocolate everywhere. It was on my iPhone, all over her special birthday dress, and everything else in sight.